I confess I've been giving some thought to letting it all go. I do try to be upbeat about things but, looking back over the last year, gardening seemed to be fraught with problems to be overcome rather than a source of pleasure. Looking forward, I can see the same issues waiting for me: no outside tap for watering, foxes and cats waiting to dig it all up, neighbours helping themselves without helping. Really, is it any wonder that I long for a nice large back garden to call my own? P.S. Since writing the above, my sanity has been rescued by a friendly neighbour who has come outside to support me with tidying up the post-winter veg patch. My intention was to clear the beds ready for any growers who might be interested but, in doing so - and finding strawberries and herbs springing back into life, I've started to consider what I enjoyed most about last year's growing season and may be here for a while yet - albeit concentrating this year on gardening with the children. 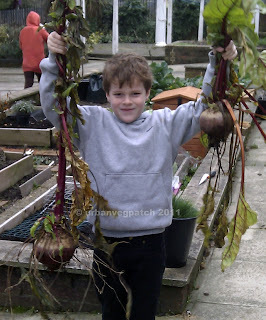 Here's Archie (a very reliable and enthusiastic assistant) helping with clearing the monster beetroot/s.